Reigns hits a shoulder block and Del Rio backs off. Del Rio mounts Reigns in the corner, but Reigns trips him and delivers punches to Del Rio. Del Rio hits a pair of kicks and puts Reigns in a rear chinlock. Del Rio uses strikes to control the match, but Reigns hits a clothesline and a suplex to build momentum. Del Rio uses the ropes to choke Reigns and hits a strike from the top rope. Reigns comes back and clotheslines Del Rio out of the ring. Del Rio pushes Reigns into the ring steps. Del Rio hits another strike from the top rope and gets a 2 count on Reigns. Rear chinlock by Del Rio. Reigns sets Del Rio up on the top turnbuckle, but Del Rio applies a cross arm breaker over the ropes. Reigns powers out and punches Del Rio to the floor. Del Rio gets back into the ring and Reigns delivers a Samoan drop. both men are slow to get up. They exchange punches. Reigns builds momentum with clotheslines in the corner and a big boot. Reigns sets up for the Superman punch, misses, and takes a back stabber for a 2 count. Del Rio calls for the cross arm breaker. He misses and Reigns powers him up into a powerbomb. 2 count for Reigns. Reigns gets distracted and takes an enzuigiri for a 2 count. Del Rio misses a kick and takes a Superman punch. The League pulls Del Rio out of the ring. Reigns goes after Sheamus and a big brawl breaks out. It was a fine match up until the end. Nothing unexpected happened, but it was fine. Kind of unremarkable. With so many people around the ring and the way things have been going, an ending like this was pretty inevitable. Ziggler wrestles Breeze down to the mat for a quick few covers. Breeze grabs the ropes for a break and delivers a back elbow. Side headlock by Breeze. Breeze hits a dropkick for a 1 count. Breeze uses the ropes to attack Ziggler’s knee. He attacks the leg. Breeze transitions into a half crab. Ziggler counters into a cover, but Breeze immediately goes back after Ziggler’s knee. Breeze goes to use the ring post but Ziggler escapes, pulling Breeze into the post. As Breeze gets back into the ring he takes a superkick from Ziggler. Good match. I liked Breeze’s attack. The ending came a little out of nowhere, but it made pretty good sense. They both had some good grappling and transitions. Rusev announcing his engagement to Lana and Ryback being a jerk from RAW. Kofi talks about Lebron James’ endorsement deal. 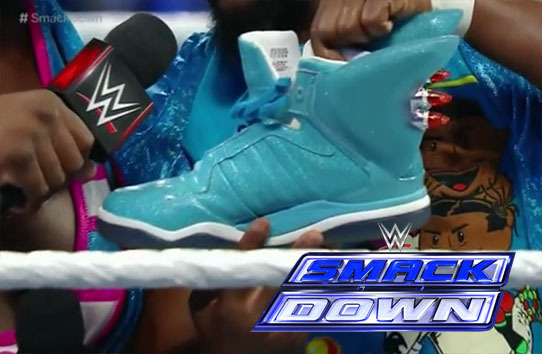 New Day wonders where their endorsement deal is. They also say that their match at TLC is unfair. Kofi and Kalisto keep missing each other. Stalemate. Sin Cara tags in and launches Kalisto into Kofi. Woods makes a blind tag and New Day dumps Sin Cara to the floor. Big E tries to use Woods’ trombone but can’t get it to work. Unicorn Stampede on Sin Cara. Big E still can’t work the trombone. New Day isolates Sin Cara. Sin Cara powers Kofi into a one-arm powerbomb. Both men tag. Kalisto flies and dominates Woods. Sin Cara tosses Kofi to the floor and dives out after him. Kalisto hits Salida Del Sol on Woods for the win. Pretty good match. There were a couple of slightly awkward moments with Sin Cara that looked like they didn’t go exactly right, but they weren’t terrible. Overall it a was a pretty fast-paced, decent match. Seeing Big E try and fail to play the trombone was pretty funny. Michael Cole hosts the contract signing for the IC title match with Dean Ambrose and Kevin Owens. Kevin Owens has his lawyer, Matthew Douglas, sign on his behalf. Owens then attacks Ambrose from behind as he goes to sign the contract. Ambrose fights back but Owens tosses his lawyer in the way and backs away up the ramp. Dirty Deeds to the lawyer. The Ascension makes some tags to try to double team Ryback, but Ryback dominates. He hits the Meat Hook on Viktor then delivers Shell Shock. Not a good match. It was barely even a match at all. It was just build up for TLC. Ryback is strong. Becky frustrates Paige with a few arm drags. Paige takes a break on the floor and gets back in the ring with a kick to Becky. Paige controls the match until Becky comes back with strikes to build momentum. They both go for a clothesline and knock each other down. Charlotte’s music plays and she walks to the ring. Paige is distracted allowing Becky to apply Disarm-Her. Okay match, but it was pretty short. It wasn’t terribly competitive and it was really just a way for Charlotte to get one over on Paige before TLC. Recap of the Sheamus/Reigns feud. Del Rio starts with Jimmy. They fight pretty evenly. Jimmy tags Jey and Del Rio tags Rusev. Rusev hits abig heel kick and starts to dominate the match. The League makes some tags and uses dirty tactics to control the match. Sheamus is in control of Jey. He lands clubbing forearms, but Reigns enters the ring to break it up. Jey tags Ambrose. Ambrose gets the better of Sheamus with strikes and a bulldog. Barrett stops his momentum with a trip from the outside. The League isolates Ambrose with multiple tags. Del Rio hits a back stabber for a 2 count on Ambrose. Sheamus tags back in and continues to hurt Ambrose. Rusev tags in and puts a bear hug on Ambrose. Ambrose escapes with a neckbreaker. Ambrose ducks an enzuigiri from Del Rio and delivers a tornado DDT. Reigns gets the tag. Reigns dominates Rusev. Rusev lands a knee but takes a running lariat. Reigns hits the Superman punch. The match breaks down. The Usos dive to the floor on Sheamus and Del Rio. Reigns hits a spear on Rusev for the win. Okay match. Nothing wrong with it but it wasn’t anything special. The breakdown at the end was really quick and Reigns dominated completely once he got into the ring. I could have done with the same eight guys out there for two extended segments and them seeing them individually throughout the show. There are other people on the roster that would love some of that time. Overall the show wasn’t bad, but it wasn’t must-watch either. There were some good matches but there were some bad ones too. I think this was a middle of the road show. It had the best wrestling and the best story. This was easily the bast match of the night.